Like my friend Tina wrote on another post, “Spring?” – the cloudy sky and continuous rain here in Sao Paulo look a lot more like fall. 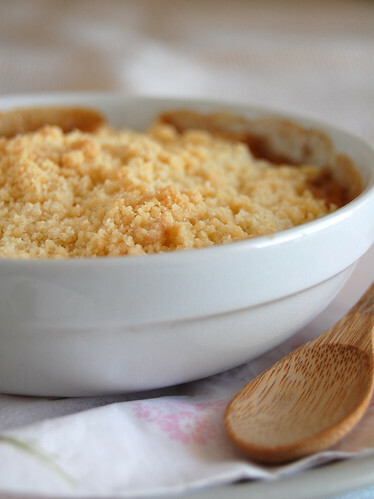 To warm up these cold days, something delicious and easy: crumble. I used two different recipes from DH mag to create this pear version – one of the original recipes called for apples and looked wonderful, too. Preheat the oven to 180ºC/350ºF. Place the pears, sugar, lime juice, water, vanilla (seeds + bean) and cinnamon in a medium saucepan and mix to combine. Cook over medium heat for 5 minutes, stirring a few times, until pears are soft and liquid is syrupy. Remove from heat. Spoon the pear mixture into two 1 cup-capacity (240ml) ovenproof dishes. Make the topping: place all the ingredients in a bowl and, using your fingertips, rub them together until mixture resemble breadcrumbs. Sprinkle over the pear mixture and bake for 30 minutes or until golden. Pears are a nice twist on an Autumn dessert as an apple substitute. This looks so enticing! I love ur blog. I was reading online that you are the Madeleines Queen.I have been wanting to bake madeleines for years and just was so worried they were too tricky. i tried emailing you but i couldnt. I did one of the madeleine recipes and followed instructions ecaxtly and as soon as they were i the oven for few minutes the edges were so burnt. Can you let me know how to avoid that ?? did i over butter the pan ? did i leave it in the fridge for too long ? What a delicious looking crisp. Since pears are in season here, it would make a lovely autumn dessert. Aren't pears wonderful right now? I was trying out a new recipe today with pears- and have 3 left over. 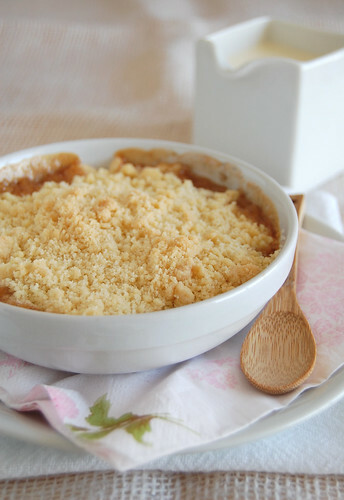 Going to make a small version of your crumble! Why have I not tried this before. Can't wait to have some pears. I like this twist with the pears! A nice little comfort dish! This made me instantly hungry - would love to try this one out. Mmmmm... I adore crips. Pear sounds yummy! Maha, maybe that happened because the oven was too hot - are you using non-stick pans, black ones? Because those tend to make much darker madeleines. Which recipe did you make? Give me more details, let's try to figure this out together. Barbara, I hope you enjoy it, dearie! Michelle, pears are wonderful, don't you think? I did use a non stick Teflon pan . I am going to buy different pans from amazon, but these pans were the only madeleiens pans i could find in Kuwait, where i live. I did refrigerate the batter overnight in the fridge. I also buttered and floured the pans. I didnt get the hump aslo which is supposedly what the madeleiens are famous four. I will give madeleines a seconed try , using the recipes you have tried. Do you recommend a certain recipe? Thank you for your help , and sorry i keep posting about madeleines in a non related topic.